I’d thought I’d heard all of my mom’s stories but as we sat at lunch about a year ago, she shared something I’d never heard before. It was a shocking and sad revelation for me. 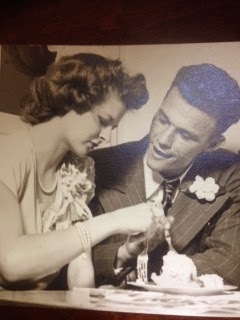 My mom and dad eating their wedding cake. Of course, I knew that my mom, Vivian, was orphaned by the time she was ten. Her dad died when she was seven and her mother died when she was ten. I can’t imagine the grief and “lostness” she must have felt. And unfortunately, in those days, rarely was anyone allowed or encouraged to grieve. How sad it must have been for that little girl to have no means to express her sorrow. I also knew that when her parents were living, mom grew up in Michigan along with her cousin, Eileen, as her best friend. They were together constantly and mom adored Eileen’s parents, who only lived a short distance away. Eileen (for whom my middle name is named after) went to the same school as mom. I also knew that when mom’s mother died, Edna was chosen by the family to raise my mom and her fourteen-year-old brother, Harold. Edna was my mom’s aunt–her mother’s sister. Everyone knew how Edna came from California to Michigan to pick up Vivian and Harold and take them “home.” But Edna had never had children, was a widow, and worked full time. Mom and Harold were on their own. My mom says she never remembered a home-cooked meal. They went out to dinner at the cafeteria every day. I listened carefully for I realized I had never heard this information before. I was in tears hearing this. As she related this story, I could barely contain my sobs. To think of this little girl knowing she missed her opportunity to live with a loving family was beyond my comprehension. And how it must have fueled her dislike for her brother–who she was bound to blame for getting in the way of her desire. I could understand afresh the value my mom placed on family. It was the driving passion of her life. For a decade, as a child, she had been denied the family of her dreams and at twenty-one when she married my father, her dream was fulfilled. It explained so much about her motives–and that dream. As I think of my mom who is now discovering Jesus fully satisfying in heaven, I think of we as Christians who have been adopted into the security of a forever family. We long to be reunited with Jesus for there is a part in all of us that longs for the security that humanity experienced in Eden. Because Adam and Eve were banished from Eden, we all in one way or another, are now living out the desire in our hearts to be returned to paradise and be a part of a perfect family. How wonderful that heaven includes our perfect family and our adoption in Christ will be completed. We’ll no longer need to dream of finding our way home. My mom’s shocking and sad revelation of the longing within her dream no longer has one whit of importance for her. Jesus in her heavenly home provides the fulfillment of everything important. May we remember that will be true for us also when our own dreams seem unfulfilled here on earth. Beautiful! Thank you for sharing that most personal experience. Thank you for taking the time to come by and commenting. I appreciate you doing that. This is such a bitter-sweet account. Thank you for sharing your and your mother's hearts. How thrilling to think of her reunited with her family, finally able to snuggle in the circle of their love. And I can picture Jesus smiling as he watches them enjoy one another. Golden, Thanks so much for reading my story. I appreciate your comments and especially the picture of Jesus smiling as they all enjoy each other. What a glorious joy that will be for all of us! Thank you again!